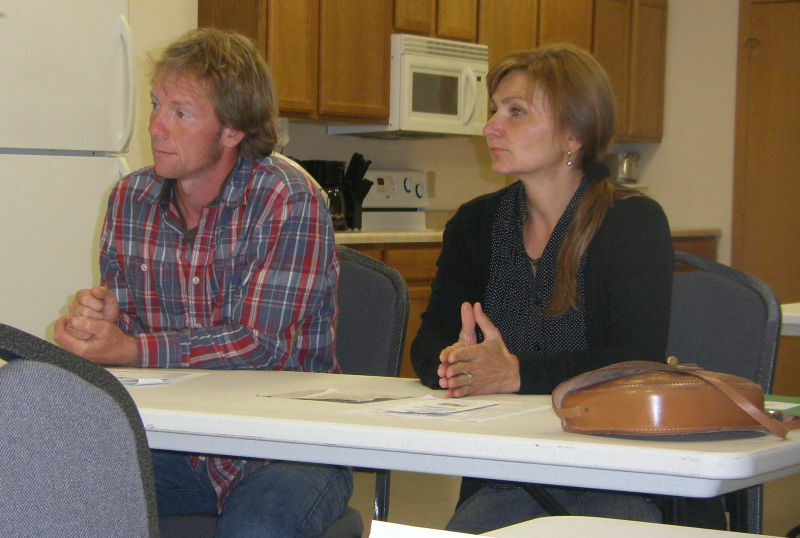 The Anamoose JDA & Civic Club met together Monday night to hear Mirek and Julia Petrovic, who live north of Anamoose, and Sue Balcom, the director of the FARRMS agency located in Medina. Mirek and Julia Petrovic plan to start a Food Hub in the former Sally’s Upholstery building. Using a Food Hub, small farmers and growers can take their produce to a central area to pool their resources that can then be sold to schools, prisons, grocery stores, and restaurants, etc. The manager of the Food Hub will find markets for the produce using a specialized computer software program. Mirek stated the basement will be ideal for cold storage. A certified kitchen will be added to the back of the main floor so food could be preserved by canning, dehydration, etc. to add value to the product. In addition, the certified kitchen will be used to pool resources so that members can have their value-added items tested to be within guidelines set by the USDA and First Health District. Sue Balcom shared information on Food Hubs. She talked of the “Investment in your community for future generations”, the “need to educate consumers and need to educate farmers.” “Schools do not want to deal with individual farmers.” Balcom expressed her excitement about having this Food Hub, the first to operate in the entire state. Mirek and Julia Petrovic are requesting $15,000 from the JDA/Civic Club to replace the roof and gut the second floor. During phase 2, they plan to convert the 3 apartments into 2:one 1-bedroom and one 2 bedroom. Mirek has owned and operated a construction firm for 23 years and will do the work on the building himself and will hire a crew to assist him. It’s wonderful to hear of this new venture in Anamoose. If folks from other locations can bring produce into Anamoose and not have it go to waste, it will be a great asset to McHenry and maybe others, as well. Thank you to the community for being so mindful of our future.